Listen on the go! Subscribe to the podcast on your mobile device! What does project based learning with Chromebooks look like? In this episode I am joined by Wendy Nimtz, 5th grade teacher at Our Shepherd Lutheran school in Birmingham, Michigan. Wendy believes in the power of active learning and project based learning is a big part of her classroom. Wendy’s cart of Acer Chromebooks plays a central role in providing students access to new creative tools they can use to create awesome projects. What is the most efficient way to get Chromebooks in and out of a cart? Wendy’s first digital project….and how she revised it to make it better! Tips for grading and evaluating student projects. Practical tips to for teachers who want to incorporate projects based learning. What does Wendy’s Classroom look like? 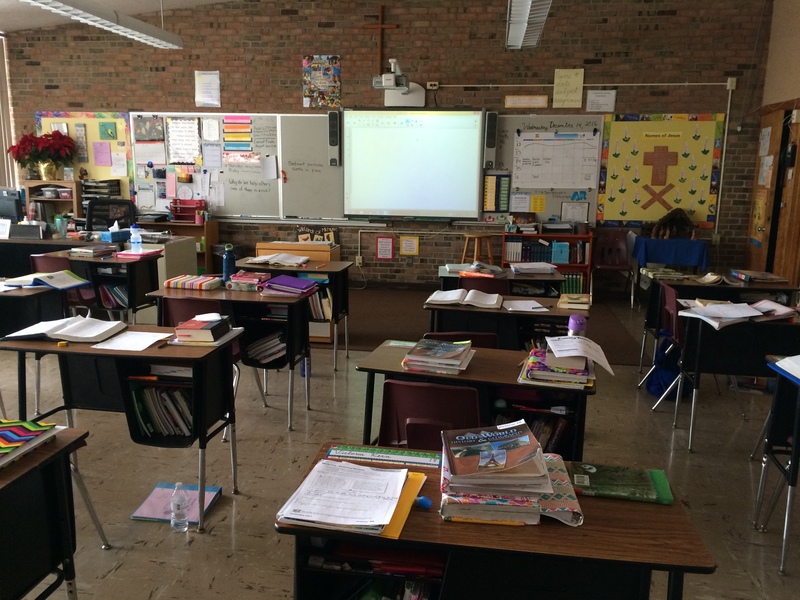 Wendy and I spent some time talking about the physical setup and arrangement of her classroom. These small details can make a big difference with classroom management and getting started each class period. Sometimes it’s the little things that have the biggest impact! We talk about how Wendy’s students move Chromebooks in and out of the cart and her expectations for for them each day. Wendy even shared a picture of her classroom with us! As her access to classroom technology has increased, Wendy transitioned her paper-based projects (posters and flip books) into digital projects (Google presentations and drawings). I spend quite a bit of time asking Wendy to explain how she designs these projects and how she manages the time constraints of her classroom. Teachers who set up a project based classroom can just sit around and drink coffee while their students are working! Well…that’s not exactly what Wendy said! Helping students develop a routine takes several months. Once they understand what they need to be doing, Wendy spends her time monitoring and helping groups and providing “just in time” support. Wendy also shares the importance of Google Classroom which is the one-stop location for project guidelines, progress reports, and feedback. For Wendy and her students, Google Classroom is an essential tool. Grading student projects can be overwhelming. Where do you start? Wendy shares her process for evaluating student work and has also generously provided several grading rubrics for her projects! Wendy shares some practical tips for teachers who want to incorporate project based learning into their classroom. Start small and seek support were the two tips that stood out to me. Wendy shares several additional tips, but you’ll have to listen to the episode (starting at 37:00) to hear them! If you have any questions or would like to send Wendy an encouraging note, email her here! Did you enjoy this episode? Leave an honest review on iTunes or Stitcher!